Times Square or “Red Square”: Shakedown of America (video & pics) | the "silent" majority no more! For 90 minutes, on April 9, 2011, Times Square was transformed into RED Square. The Leftists were all over the city. Union Square was taken over by the Muslim contingent and Times Square was…well…RED Square. 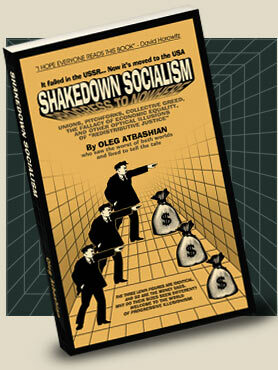 The Union-sponsored Socialist Shakedown of our economy was in full bloom. Seemed like every union was there: teachers, colleges, schools, educators. Yep…The AFL-CIO was our HOST. WHO’s gonna pay their salaries? LOTS of happy union members (and Marxists) came out to play so 7th Avenue was PACKED on both sides of the street. Something the police NEVER allow other rallies to do is to stand on the WEST side of 7th Ave. but … since our public-sector police are UNION, they were being overly accommodating (it would seem) to the AFL-CIO. According to an officer I asked, that last block from 38th to 37th was never used. The pens were empty. Rather than force the crowd to fill the pens all the way to 38th street, the police even let the crowd jam the sidewalk on the East side of the avenue. The police pushed the crowd so far into 7th avenue that they left only about a lane and a half open for traffic. So many teachers proudly marched to the Socialist meme of “Down with the Rich . Up with the Little-Guy”. Preaching ENVY, Racism & Resentment. And the Chant of the Hour: WE ARE ONE. Their Goal: Destroy everything that made America a successful economy. Down with Initiative & Creativity. Down with Individualism. UP with the Collective! Assisted by the happy, fist-pumping IDIOTS who think the fat-cat union goons chanting “We are One”….are their friends in need. Indeed? SAD. Very sad.